This Sunday worship services will begin with the proclamation that: Christ is Risen! Christ is risen indeed. Alleluia! Let me follow that proclamation up with a good Lutheran question:“What does this mean?” What does it mean that Christ is risen? What does resurrection mean? The truth is that there are about as many different explanations of Christ’s resurrection as there are Christians. And that’s a good thing, because the question of the resurrection is a question that lies at the very heart of Christianity. So, is it any wonder that Christians have been struggling to come to terms with resurrection since the very first rumours that Christ had risen began to circulate. Over the centuries the various responses to the question of resurrection have divided Christians as various camps work out various responses. For atheists, agnostics, and people of other religions the physical resuscitation of Jesus’ body is simply out of the question because it lies beyond reason. For a whole lot of Christians, and I dare say many of you, “believing in the resurrection” means believing in the actual physical resuscitation of Jesus’ body. And there are a whole lot of other Christians who don’t believe that believing in the resurrection means that you have to believe in the actual physical resuscitation of Jesus’ body. And there are a great many Christians for whom the actual physical resuscitation of Jesus’ body is a moot point; that the entire argument is simply irrelevant. So, on Easter morning, when we gather together to celebrate the resurrection, the question of whether or not we believe in the resurrection hangs in the air like an unwelcome smell. A smell made all the more pungent by our 21st century sensibilities. A few years ago, an American polling group from the southern Bible-belt conducted a poll of North Americans that for once included, Mexicans, Canadians, and Americans. The results of that poll confirm that the issue of resurrection has lost its grip when it comes to Easter. When questioned about the significance of Easter, fewer than half of those polled even mentioned Jesus. It seems that for many, the Easter bunny is a more plausible character than Jesus. It is clear that Christianity’s preoccupation with the strange events that happened after Jesus’ death has become a stumbling block that prevents a great many people from ever hearing the actual teachings of Jesus. The idea that a dead man came back to life some 2000 years ago is simply too much for 21st century minds to accept. So, while a good many sermons will be preached this Easter morning that clearly declare that Jesus physically rose from the dead, the Bible itself is much less clear on the details of the resurrection. Mark, the oldest gospel, written at least 40 years after Jesus died, ends with the mystery of an empty tomb, with no appearances by Jesus. In the other gospels, we have various confusing and conflicting details about the resurrection appearances: in some Jesus is not recognized, even by his former disciples who spent years following Jesus under the most intimate of circumstances. In some of the appearance stories, Jesus takes on ghost-like qualities by suddenly appearing in and then disappearing from locked rooms. These scant, confusing and conflicting accounts, don’t give us much to go on, and yet without this strange experience of resurrection, whatever it actually was, we would not have Christianity as a religion. So, what are we 21st century followers of the teachings of Jesus to do? Must we check our brains at the door? Do we suspend reason and experience and simply accept, despite what we know of reality, that Jesus physically rose from the dead? Or, do we simply avoid the issue altogether? I must admit that I’m tempted to avoid the issue. After all, on Easter Sunday, most worshippers have places to go and people to see. On the whole, I suspect what most worshippers want from the worship service is some lovely uplifting music, and a short sermon, so that they can be on their way rejoicing. But if the issue of a physical resurrection is standing between 21st century minds and the teachings of Jesus, then surely we must not avoid the issue. Surely Easter is precisely the day when we ought to focus our attention on the resurrection. I believe preachers must address the inconsistencies in the biblical witness together with the plethora of historical and theological information that has been made available by the writings of best-selling authors who have opened up the scholarship of the academies and seminaries to the average worshipper. So, here I offer my own notes about the resurrection as I prepare to lead worship and preach on this high feast of the church year. As always, I am indebted to those scholars who have moved me beyond the dogma and doctrines of my own tradition and echoes of their work permeate what follows: John Shelby Spong, John Dominic Crossan, Marcus Borg, Peter Rollins, Bernard Brandon Scott, Glynn Cardy and the members of my congregation. The Apostle Paul wrote his first letter to the church in Corinth, about 20 years after Jesus was crucified, died and was buried. Scholars tell us that the letter was written between the years 53 and 57. That’s at least 20 years before the Gospel according to Mark, 30 to 40 years before the gospels according to Matthew and Luke and probably nearly 50 years before the Gospel according to John. The writings of the Apostle Paul contain the earliest writings that we have on the subject of the Resurrection. And the Apostle Paul’s understanding of resurrection was good enough for the early followers of the way. Paul’s description of resurrection does not conflict with our 21st century inability to accept the suspension of the natural order of the universe. You see, Paul never described Jesus’ resurrection as a physical resuscitation of Jesus’ corpse. Indeed in 1 Corinthians 15 the apostle Paul denies that Jesus’ resurrection was an actual physical resurrection. As a Pharisee, Paul believed in the resurrection of the dead and certainly he believed that Jesus had been raised from the dead. But as for our question about an actual physical body, Paul insists that this is simply a stupid question. For heaven sake, when you sow a seed into the ground and it bursts forth into new life, that new life doesn’t come in the form of a seed, it comes to life as a plant! Not all bodies are the same! The Apostle Paul did not need there to be an actual physical resuscitation of a body in order to believe that Jesus is risen from the dead. To ask the question of whether the resurrection is true, and to mean by this that only a resuscitated corpse constitutes such proof, is to impose the standards of the modern mind upon a pre-scientific culture of myth and magic. The dualism of body and soul was a Greek idea, for the Jews there could be no resurrection without a resurrection of the body. After all, could one rise without a body to rise in? What we refer to as the soul was a foreign concept to first century Jews. And so the question about the kind of body the risen Jesus had was, as Paul puts it, quite simply stupid. “There are heavenly bodies and there are earthly bodies.” Not all bodies are the same. The question of a physical body makes no sense to the ancients. Christ was alive to those early followers. Paul insists that there are natural bodies, which he equates with earthly bodies what we would call physical bodies and there are spiritual bodies which Paul equates with heavenly bodies. This spiritual resurrection that Paul describes gave birth to Christianity, within the Jewish context. It wasn’t until Christianity moved beyond Judaism that it came into direct conflict with the Greek understanding of reality, which insisted upon the dualism of body and soul. Faced with the task of communicating the gospel, the early followers of the risen Christ, began to articulate their experiences of the risen Christ in ways that the Greek influenced Roman Empire could understand. And the question of a physical resurrection arose (pardon the pun). However, the vision that Paul credits with having changed his view of Jesus is clearly that, a vision; a vision of a heavenly body. Some scholars argue that the resurrection was either a mass hallucination or that the stories were simply made up by Jesus’ followers after the death of the man they had believed to be their Messiah. But would hallucinations, or fictions have the power to sustain a movement that would become Christianity? Is it possible, that something our 21st century minds would describe as deeply spiritual happened, but that something was not a supernatural resuscitation of a corpse? The supernatural resuscitation of a corpse not only violates the laws of science, it is also difficult to reconcile a physical resuscitation with the details that are recorded in the Scriptures. What if the experience of Jesus was one in which his followers truly saw the power of God within a man to an extent that they had never encountered before? If we see God as the ground of our being, then Jesus can be viewed as a unique, but human man in whom this ground was not a distant source of existence buried under layers of ego, but was the very center of his being. Jesus life, his teachings, his compassion, his ministry of healing all radiated this power of the divine. Jesus opened up his disciples’ eyes to this power of the HOLY ONE. After the human Jesus died, what if his followers still experienced the power of DIVINITY that they had seen within Jesus, even though their teacher was no longer with them? In an age in which, what we would define as supernatural visions, were commonplace, this experience of the power of the divine that their teacher had opened them to could have been interpreted as if the spirit of their teacher had never died because the power of the MYSTERY we call God never does die. I believe that the biblical accounts of the risen Christ, represent the powerful stories told by the first followers of Jesus. Stories not about the supernatural, but about the mystical experiences of the living power of God in the world. As these stories were told and interpreted over decades in a time that expected to encounter DIVINITY in the world, these stories developed in which the resurrection is conveyed with bodily imagery. We need not take these stories literally, but we must take them seriously. When we examine the story of Jesus’ death and the mystical experience of resurrection in metaphorical terms, we can see in the story of the crucifixion the very human nature of Jesus: we see suffering, pain, doubt, and death itself — the inevitable conditions of being human. Yet in the story of the resurrection, we learn that this human condition is not the conclusion — hope exists for all of us. Behind the suffering of existence lies a power: the power of existence itself that is eternal and infinite. This power thus “conquers death” because it is the source of existence and of life. The powerful message of Christianity becomes one of light and hope: just as Jesus was able to tap into this power and just as Jesus’ life was centered on the power of the divine and radiated it. We too can do the same. We can also experience the divine ground within ourselves and within all of creation. When Paul talks about the risen Christ he speaks of Jesus as the one who was raised up into the fullness of the ONE. Being raised up into the fullness of YAHWEH… Now that’s a resurrection I can hope for. Although Paul speaks about Jesus’ resurrection as DIVINITY’s victory over death, the Resurrection isn’t some glorious taming of death, because in the end, we still die – death is still real for us … many of us know that only too well. When Paul paraphrases the prophet Hosea: “Death has been swallowed up in victory. Where, O death, is your victory? Where, O death, is your sting?” Paul is not negating the reality of death – he is reminding us that death and the grave are no longer to be feared. Paul insists that death and the grave are very much a part of the journey into the fullness of the LOVE that IS the HOLY ONE – the journey into the presence of the HOLY ONE – the journey into the heart and soul of the Living God. Resurrection reminds us that ultimately the LOVE that IS will bring life out of death. There is more good news about Easter. Easter is more than something that happened in the past. Easter is more than a day on the calendar. Easter is not just about the resurrection of Jesus or the hope that we to will be resurrected when our time on this mortal coil has ended. The good news about Easter is that resurrection is not limited to Jesus, nor is it limited to the end of our life. Resurrection is not limited to life after death. Resurrection happens throughout creation, over and over throughout our lifetimes. Resurrection can and does happen here and now. 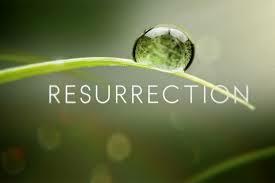 You see the miracle of Easter is not so much about the resurrection of Jesus as it is about our own resurrections. If the rumors about the empty tomb are to be believed, then we need not look for the living among the dead. Jesus has left the tomb, and if we are to follow Jesus then we too shall have to leave our tombs. To follow Jesus we will have to leave the old trappings behind like shabby grave clothes, if we are to live in the Light of Christ. The resurrection to which Easter calls us—is our own—and resurrection requires that we prepare to find the HOLY ONE where LOVE is by opening ourselves to the world around us with our eyes and ears open wide to new life. This means that we must be prepared to be surprised by God in strange places, in ways we never though we’d see and through the words of those we never thought we’d hear. We must allow others—even those whom we have until now refused to consider—for they too are in need of resurrection and we must open our hearts to things we do not want to hear. We must release the voice of the DIVINE in everyone, everywhere. In Jesus, his followers heard the voice of the HOLY ONE. In Jesus, his followers discovered the wisdom of YAHWEH. In Jesus, his followers experienced theLOVE that IS the MYSTERY we call God. Those who followed and loved Jesus experienced life in ways that were so earth shattering, so mind-blowing, that their lives would never be the same again. The power of the love they experienced in their life with Jesus could not be constrained or ended by Jesus’ death. Long after they found the empty tomb, Jesus’ loved ones continued to experience his presence in very real ways. In the breaking of the bread, and in the meals they shared together; as they walked the pathways they had walked with Jesus, and fished the waters they had navigated with Jesus. There in those places they encountered the power of Jesus’ love that could not be limited by death. That love had the power to raise them from their own tombs. And that love has the power to raise us from our tombs. Those dark caves that hold us captive and keep us from living. By the power of LOVE we can leave behind the tattered grave-clothes that bind us so that we can follow Christ into the light. Christ is risen! Christ is risen indeed. Alleluia! Christ lives and breathes and has being, in, with, through, and beyond us! This entry was posted in Adult Education, Bible Study, Evolutionary Christianity, Progressive Theology, SERMONS, STORIES, Theology and tagged Bernard Brandon Scott Easter, Easter 1 Corinthians 15, Easter in the 21st century, Easter Sermon Bernard Brandon Scott, Easter sermon for the 21st century, Easter Sermon John Dominic Crossan, Easter Sermon John Shelby Spong, Easter Sermon Marcus Borg, Easter Sermon not physical, Jesus did not physically rise from the dead, John Dominic Crossan Easter, John Shelby Spong Easter, Marcus Borg Easter, preaching Easter in the 21st century, preparing to preach at Easter, progressive christian preaching Easter, progressive christianity Easter, progressive christianity Easter Sermon, resurrection not a physical resuscitation by Rev. Dawn Hutchings. Bookmark the permalink.